The thought of fighting big fish from a kayak is enough to raise the pulse of any angler. However, you should never pick such a fight without a battle plan, especially when your battleground is not open terrain because any hooked fish will run for cover. Fishing from a boat or land provides fairly solid anchorage, but what do you do when you are fishing from a very “towable” vessel, like a kayak? While not everyone will choose the same ’yak model, the strategy for winning the battle against a big fish is basically the same for everyone, whether (like me) they have a pedal-propelled kayak with reverse capabilities, a paddle-only kayak, or something in between. Having the capacity to back out of the structure is certainly a benefit that can turn fate to your favor, but pulling backwards on a big fish won’t always be the right strategy. You need a plan of attack that considers every conceivable contingency. A big fish, if hooked, will likely run back to its snag. The fish will likely have the power to tow your kayak. The fish will likely be lightning fast. The actual choreography of your fight will vary, depending on the style of kayak you have. Nowadays, many kayak anglers opt for pedal-propelled kayaks to keep their hands free for fishing. This has enormous benefits when you’re hooked up because you can put powered pressure on the fish without compromising your rod work. Paddle-powered kayaks have been around a lot longer, however, and the basic battle plan to fight a fish from any kayak was developed long before the first pedals hit the water. Regardless of your vessel, you should approach every cast ready to fight a fish. Your priority should be to identify your best “exits”. 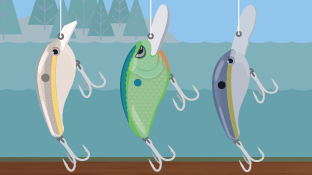 Which way should you head once you’ve struck your fish? Think about this before you make your cast. Once the fish picks up your gauntlet, you won’t have time to plan. 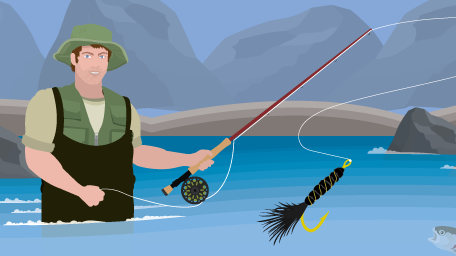 You can’t afford to put your rod down to pick up your paddle once you’re hooked up to a fish. If you are in a paddle-only kayak, your success will come down to the direction in which you face your kayak in relation to your rod angle and the fish. You will not have the ability to drive away from the structure, so you will need to persuade the fish to swim away from it instead. The first thing to realize is that even a fairly modest fish can easily tow you if the nose of your kayak is pointing towards it. Try to position your kayak perpendicular to your cast. That way, if a big fish strikes and runs, it has to drag your full hull length against the water. That’ll slow it down a bit! If you are running a kayak that has a rudder, make sure you set the rudder at full lock to steer in the direction of your exit route. This will help you with your next challenge: getting the fish away from the structure. You need to persuade the fish to swim in the direction of your planned exit. To do this, firmly and smoothly pull your rod-tip around to point in that direction. Your goal is to steer the fish that way. As you pull against the fish, your kayak will inevitably start to turn back towards it. Don’t stress. As the fish turns towards the kayak, the pressure will lessen. (IMPORTANT: Don’t allow your line to go slack! Wind up any slack line to maintain tension.) The fish should instinctively head in the direction of less resistance. If all goes well, the fish will soon head out through your planned exit point, and your kayak will fall in behind it – an easy tow now that your bow and rod are in line with your fish. Once you are happy that the fish is clear of the structure, you can once again turn the bow across the fish’s path to reapply that drag pressure. Do this by pulling the rod around to your side and twisting in the opposite direction with your waist. Once your kayak is in its “braking” position, you can fight the fish on the rod. Naturally, if the fish manages to run towards more structure, you need to steer it out again and let it run clear. It’s not a bad idea to practice some of these maneuvers on a snag or a piece of structure rather than waiting to test your skills on the fish of a lifetime. Of course, hooking such a fish and maneuvering it clear of the structure is only part of the quest. At some point, you will either win or lose any fight you engage in. So what do you do when you’re in deep water, in an unstable vessel, attached to a fish that weighs nearly as much as your kayak? This is another situation you need to plan for – and it will vary depending on the species you are targeting. Different objectives and circumstances call for different solutions. Do you plan to release the fish after taking some pictures of it, or do you intend to eat it? Whatever your objective is, a secure tether is a wise choice to include in your kit. If you’re planning to practice catch-and-release, you’ll need to think about quickly getting your fish to safe waters where you can photograph it before its release. Keep in mind that a thrashing 50-pound beast may capsize your kayak if you try to lift it aboard, so shallow banks or sheltered waters are your best bet. 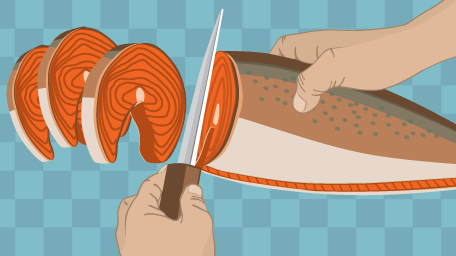 If dinner is on your mind, you need to plan a safe way to get your fish back to shore. If you have an icebox on board that is big enough, a humanely dispatched fish should come aboard safely enough. If you have to tether it, however, be sure to consider the dangerous possibility of attracting predators. You need to think about this part of your battle thoroughly if you want the chance to pump your fist in the air in a victory salute. Every bit of space in your fishing kayak is precious, but this does not justify neglecting your personal safety. At all times, you should wear a personal flotation device (PFD). In the interest of safety, comfort, and space, invest in an inflatable model that doesn’t restrict your ability to move. Consider your tether anchor point carefully. If you intend to wear a wrist tether (such as lip-grips), be aware that a thrashing, large fish can cause an injury in this situation. The quick, effective dispatch of any large fish you intend to take home to the table will be imperative to your safety. In the limited space of a kayak, it is not wise to have loose sharp tools, so consider using a compact but solid “priest.” For more information, read our article on humanely dispatching your catch. Jo Starling didn’t completely succumb to fishing fever until 2003 when she started fishing with ‘the girls’. 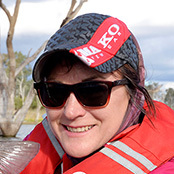 Jo now strives to be a versatile and accomplished angler, pitting herself against every angling challenge she can. She enjoys all forms of fishing from fly to game, and shares her passion and skills through workshops, clinics, articles, and videos, as well as through visual art and design.